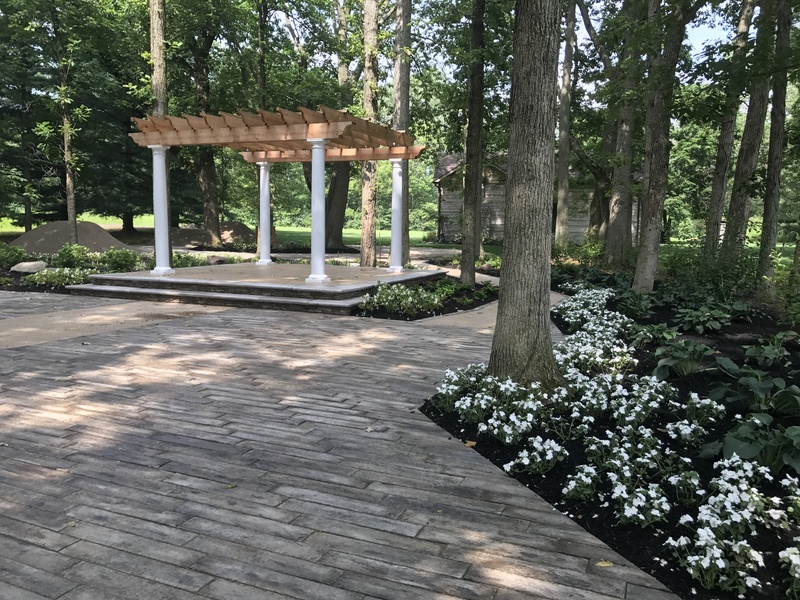 August 7, 2017, Muncie, IN – Jay Crew was hired by Tyler and Paula Ridge to design and install landscaping at their new wedding venue Bailey’s Place in Selma, Indiana. This venue was designed around a charming little cabin built in the 1800s that the family had recently restored. With a pergola built as an alter space and hardscape already put in, they were ready for landscaping design to begin. After consultation with the Ridge’s, Jay-Crew mapped out a design and began work early this summer. The area was heavily wooded, and weeds and bushes needed to be cleared out. Once finish grading was complete, our team brought the space to life with the installation of white blooming flowers and plants that blossom at the right time of the year – wedding season! We also made sure to incorporate landscaping materials that are very shade tolerant. All of this was done to accent the historical elegance of the cabin and surrounding space. The Ridge family will host their first wedding this fall for their son.